I’m no stranger to bah humbug. Every time something wonderful sweeps the nation into a state of positive delirium, you will find me in a corner sulking. With a gin and slimline. I’ve never recovered from the shock of London hosting the 2012 Olympics. And why should I? The circus is coming to town. I will have walk to work. Wear ugly trainers. And battle tourists to reach shops/supermarkets/hairdressers. But the circus has well and truly already arrived. In the run up to the Queen’s Diamond Jubilee weekend, I shoved my way through legions of grown people staring at men on horseback, squealing: “Excuse me, I have to get to work”. My office, of course, is situated right by Buckingham Palace in a cruel ironic twist. Then there were the road blockades. The absence of black cabs. Did I mention the throngs of tourists? No, I was not going to get into the spirit. Besides, I am a first generation immigrant. What has the Jubilee got to do with me? And yet, come the main weekend itself I could not help but get swept into the excitement. First, we invited ourselves to the penthouse of a friend’s flat overlooking the River Thames. Next, I dressed the kids in red, white and blue. And finally, I stood on said terrace waving flags. Waiting for the Indian boat to come along! The verdict: All great fun. A testament to an expanding cultural mindset of a new generation. Or something. I’ll still be sulking in a dark corner during 2012 Olympics though. This creamy, smooth Dal in Coconut Milk (from a can natch) might just soothe the frayed nerves ahead of the big moment. Blend the red chillies, garlic and whole cumin together with a tablespoon of water until smooth. In a large pot, bring the oil to sizzling, slice the onions and saute until golden. This should take about 10 minutes. Next, add the masala paste and fry it with the onions for another five minutes. It will probably stick, so reduce the heat to a medium high and add a couple of tablespoons of water to release the mix from the bottom of a pan. Then, wash the dal thoroughly in a sieve under a cold running tap and stir into the masala in the pot. Add two times as much water as dal, preferably measured in the same cup and bring to a boil. Then cook on medium high for about 15 minutes. Finally stir in the ghee, sugar, vinegar and coconut milk, salt to taste simmer for five minutes. While it’s simmering, attack the dal with a potato masher or wooden spoon to get a smooth texture. 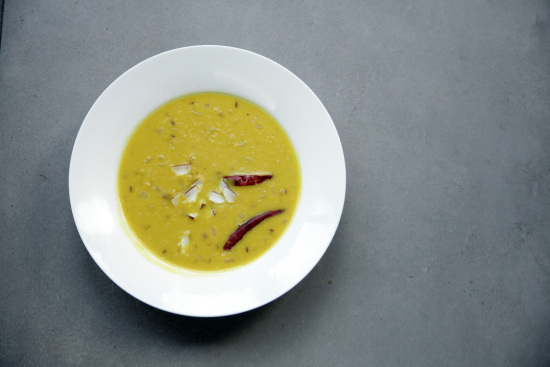 This dal is an excellent partner to a spicy curry like the Prawn Patia. Am I missing the part about the white vinegar? I’m afraid to add it! enjoyed reading it, you’re a great author. I will be sure to bookmark your blog and will come back later on. I want to encourage one to continue your great posts, have a nice morning! Wow masoor dal with coconut milk, sounds nice. Thanks for sharing.